Gemma Paternoster rode her own Zonneglans to the win in the opening $7,500 Horseflight Open Welcome Week I. The Atlanta Fall Classics celebrated its 20th anniversary at the Georgia International Horse Park, home to the 1996 Olympics, and wrapped up two weeks of AA shows last week to close out the 2015 Classic Company calendar of world-class show jumping events. “I can’t believe it’s already been twenty years,” commented Bob Bell, President of Classic Company. “We appreciate the support of the trainers and riders who have shown with us over the past twenty years,” he continued. “We have enjoyed watching the riders and horses develop with us and feel very fortunate to call our customers our friends,” he added. “Our success is a testament to their support,” he said. “We will continue to improve our shows over the next twenty years and look forward to future generations competing at the Classic Company shows and becoming part of our family,” he added. The Classic Company’s 20th Anniversary Reception took place at Cherokee Run Golf Course, located down the street from the Georgia International Horse Park. Bob Bell, city managers and officials from the Georgia International Horse Park, as well as trainers and riders, attended the gathering. Top course designers, Manuel Esparza and Michel Vaillancort, were on hand Weeks I and II, respectively, created challenging courses in the Olympic Arena Week I and II. The arena acted as the backdrop to firsts and lasts for grand prix rider Gemma Paternoster, formerly from England now residing in Wellington, Florida. The Atlanta Fall Classic debuted her return to the grand prix arena after having recovered from an accident in August whereby she broke her shin bone. She returned to the competition ring complete with titanium and pins and won the Atlanta Fall Classic’s opening $7,500 Horseflight Open Welcome in the irons of her own Zonneglans and rode her beloved Osiris in his last competition before retiring him and sending him back to England. “He was supposed to retire in August, but after I got hurt, I knew that once I learned to walk again, he would be integral to my ‘saddle rehabilitation’,” commented Paternoster. Week II saw David Jennings and KM Farms’ KM Corfina and his student, Haley Gassel, riding her own Quite Dark 2, as the only two of the field returning for the jump off in a technically challenging course designed by Vaillancort. Jennings won the class with KM Corfina making it their second win of the two grand prix the pair had competed in. Gassel came in second on her own Quite Dark 2. Jennings commented that “it was really rewarding to ride against one of my students.” In addition to the prize money, Jennings was also awarded a $1,000 Gift Card from Brian Hillen of Apollo Jets, the Official Charter Jet Aviation Company of the Classic Company, toward Apollo Jets’ Chartered Air Travel. Gassel won the Week I Classic Grand Prix, presented by EMO, and it was only her second grand prix win in the irons of her own Quite Dark 2. “I consider myself the underdog riding against these grand prix riders,” she commented. Gassel also won the Kastel Denmark Style of Riding Award Week II. Kaitlyn Campbell won the $7,500 Nalley Toyota Stonecrest Open Welcome Week II. She hadn’t ridden at the Atlanta Fall Classics since her days of short stirrup and she raved that since that time, the facility has undergone many improvements. “The stalls are so nice and the improvements are great,” she said. “This is a great show for our younger horses. The classes are big enough but we can just keep going until we get it right,” she added. Despite the less than desirable weather week I, the new footing in the arenas held up well. “I thought the footing was good,” said Jennings. “No one was slipping and the horses seemed to go really well,” he said. The popular $25,000 Barry Lane Jumper Classics took place during the opening weekend and kicked off with the $5,000 Classic which awarded Fit to Print Farm’s Camera Ready, ridden by Sydney Crenshaw of Canton, Georgia, first place honors. Saturday the $10,000 Classic was won by Mary Elise Nolan and her own Take a Chance. Annie Miller and her won HH Dudinka won Sunday’s $10,000 Classic and also went on to be awarded the Kastel Denmark Style of Riding Award. The $2,500 USHJA National Hunter Derbies were offered Weeks I and II and saw seasoned veteran hunter rider Julie Curtin and Charlotte Warren’s Enticement in the winner’s circle Week I and Rebekah Warren and her own Tasty awarded the blue ribbon Week II. 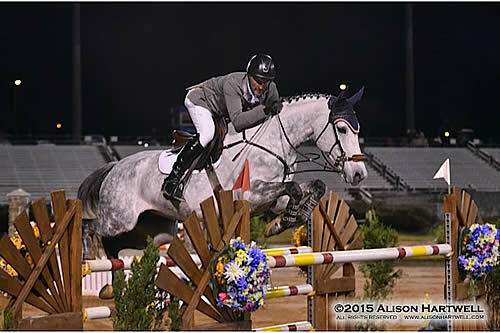 Week II welcomed the $10,000 USHJA International Hunter Derby Friday night under the lights in the Olympic Arena and a packed ringside watched Daniel Geitner ride Allison Mills’ Sky Pilot to the win. The VIP tent offered spectacular ringside seating and catered meal complete with carving stations as well as complimentary wine sponsored by Kastel Denmark. The Atlanta Classics’ Official Veterinarian, Elite Equine Sport Horse Medicine & Lameness, sponsored the 1.20 m Junior Amateur Jumper Classics Weeks I and II and awarded Catori, owned and ridden by Nancy Mcfadden, the blue ribbon Week I and Amicelli, owned and ridden by Mattie Hatcher, was in the winner’s circle Week II. Week I also crowned the National Classic Equitation Finals and Week II featured the EMO Equitation Finals and Zone 4 Finals as well as the Circuit Awards, presented by Practical Horseman. “Awarding excellence is what the Classic Company is all about,” commented Bell. “We are so pleased to have been selected to host the Zone 4 Finals and during our 20th anniversary show made it even more special for all of us,” he added. The Atlanta Fall Classics concludes the 2015 Classic Company show season. “We had a fantastic year and want to let all of the folks who showed with us that we attribute our success to all of you!” commented Bell. “We look forward to seeing everyone in Pensacola where we will be celebrating our fifth anniversary on the Florida Gulf Coast and offering the $5.00 Pre-Green Division,” he said. “We look forward to providing the best shows for you next year and hope you will join us at the Gulf this year-Pensacola and Gulfport,” he continued. “Come show with us and find out for yourself why the grass is greener on the Florida and Mississippi Gulf Coasts!” he said.